There’s nothing like losing yourself in Beaulieu’s serene grounds and gardens via the network of footpaths that criss-cross the attraction. The gardens were originally the grounds of ancient Beaulieu Abbey and later Palace House. They are now carefully managed by Beaulieu’s green-fingered team. Step off the main pathway and enjoy views across Beaulieu River from this meandering woodland route. You’ll find ancient oak trees and thick reed beds, both home to a variety of New Forest bird life. Look out for the Memorial Cairn – commemorating the death of King William Rufus who was killed whilst hunting near Beaulieu in 1100. Dating all the way back to the 1770s, this garden was introduced by John, 2nd Duke of Montagu, to complement the alterations he was making to Palace House. Visit in March and April to see the beautiful masses of snowdrops, crocuses, daffodils and bluebells that carpet the garden and Palace House moat. 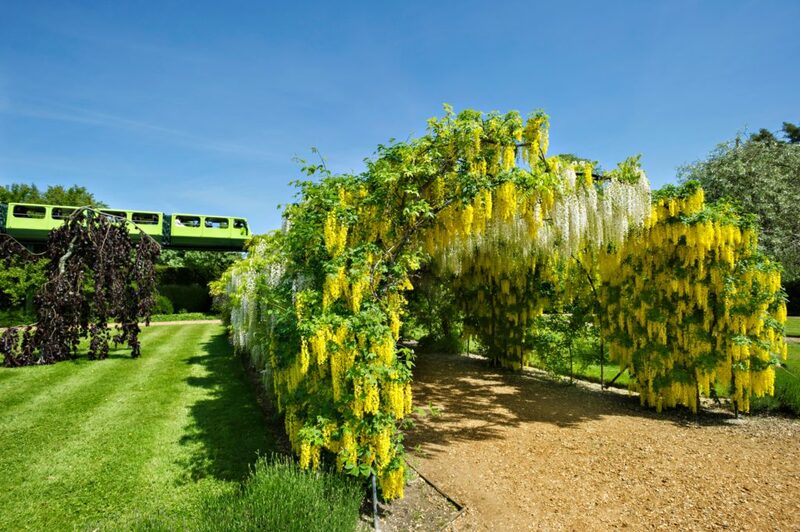 This garden and its century-old vine house has been restored to its 1872 layout, and still supplies Palace House with seasonal vegetables, fruit and flowers. Herbaceous borders crammed with colourful flowers and a sweet smelling Rose Garden planted with old garden roses, a lovely peaceful place to sit and enjoy a moment of calm. See all your favourite characters from the much-loved classic, sitting around their ‘thyme for tea’ herb planted table in the Alice’s Adventures in Wonderland topiary display. Visitors to Beaulieu can lock their love away on this unique sculpture in the beautiful and historic part of the New Forest. Come face-to-face with a giant Green Man tree carving on the Mill Pond Walk. See the many-headed serpent stretching out into the river and take a ride on the Monorail for the best view of the magnificent Griffin.